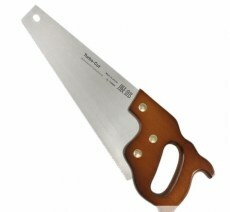 These saws are a hybrid of a western handle style and general blade dimension and Japanese tooth patterns.They cut at breathtaking speed. The crosscut pattern teeth are designed to cut primarily on the push stroke, but are also specially ground to cut on the pull stroke as well. Overall lengths 420 or 540mm, Blade lengths 330 or 450mm, Blade width 37 - 120 mm, Blade thickness 1 mm, Setting 1.10 mm, Crosscut teeth on pitch of 2.0mm or 2.30 mm.